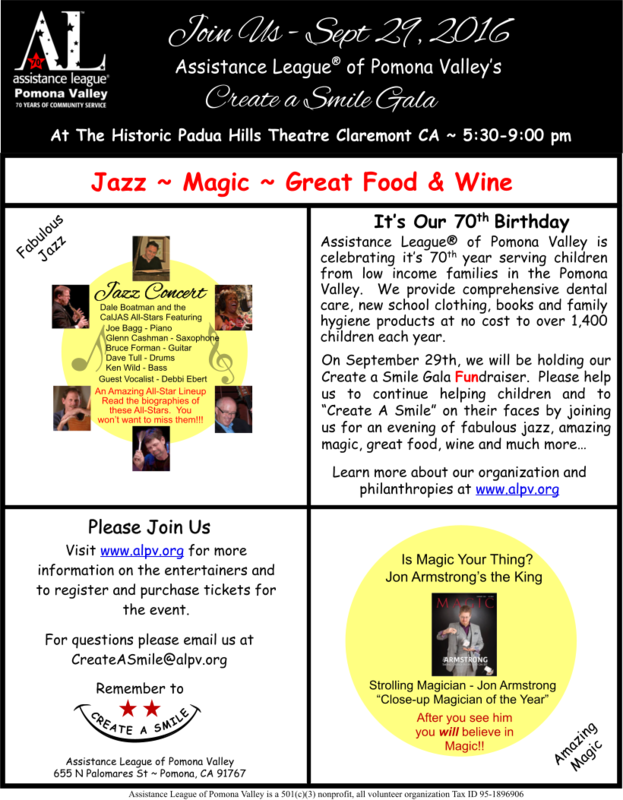 On September 29, the CalJAS All-Stars, along with vocalist Debbi Ebert and magician Jon Armstrong will perform at Assistance League® of Pomona Valley’s “Create A Smile” Gala Fundraiser, at the historic Padua Hills Theatre in Claremont CA, to benefit children from low income families in the Pomona Valley. Joe Bagg, Piano; Glenn Cashman, Saxophone; Bruce Forman, Guitar; Dave Tull, Drums and vocals; Ken Wild, Bass; and featured vocalist, Debbi Ebert. CalJAS President Dale Boatman will join the group and act as MC. Close-up Magician of the Year Jon Armstrong, will perform strolling magic for arriving guests. Read the biographies of the All-Stars HERE and Jon Armstrong HERE. We invite all of our members to support this worthy cause by attending the Gala on September 29, 2016 and enjoy a wonderful evening of fabulous jazz, amazing magic, delicious food and wine, opportunity baskets, games and much more… You will “Create a Smile” on the faces of over 1,400 children helped each year by Assistance League of Pomona Valley. On April 20, 1962, Verve records released Jazz Samba, the first major bossa-nova album on the American jazz scene. Featuring tenor sax great Stan Getz , guitarist Charlie Byrd, and Charlie’s brother, Joe on bass, it was the real beginning of the bossa-nova excitement in America, which peaked in the mid-1960s, but continues to be a major musical style. A single from the album, Desifinado, stayed on the charts for 10 weeks peaking at #15 on Billboard’s top 40…an amazing accomplishment for a jazz instrumental…and earned Getz the Grammy for Best Jazz Artist of 1963. In March, 1964, Getz struck bossa-nova gold once more with the release of Getz/Gilberto. Along with Getz, the album featured brazilian guitarist Joao Gilberto, Gilberto’s wife Astrud, and composer/pianist Antonio Carlos Jobim, whose songs became the most well known of the bossa-nova style. It won 1965 Grammy Awards for Best Album of the Year, Best Jazz Instrumental Album-Individual or Group, and Best Engineered Album, Non-Classical. In July of the same year a single from the album, The Girl From Ipanema, was released and later received 1965’s Grammy Award for Record of the Year. In 2004, The Girl From Ipanema was chosen by the Library of Congress to be added to the National Recording Registry. On June 21, the California Jazz Arts Society (CalJAS) will salute these two albums and more, as part of the CalJAS House Concert Series. Director of Jazz Studies at New York’s Colgate University, Dr. Glenn Cashman will be featured on tenor sax. CalJAS favorites Ron Eschete on guitar, and bassist Luther Hughes will round out the group. Becky Hughes and Dale Boatman will present selected vocals. CalJAS favorite Kate Reid will be returning to SoCal for a short visit in November and will make a highly anticipated appearance for the California Jazz Arts Society at their House Concert Series on November 9. Kate, a CalJAS Member, has been a longtime supporter, performer, and student instructor for the organization. This will be Kate’s fifth House Concert appearance. 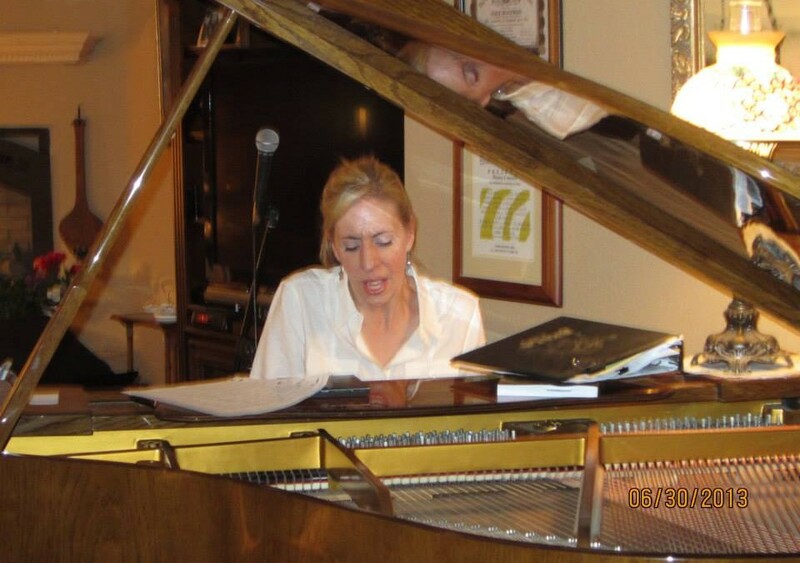 Other CalJAS sponsored events that Kate has participated in include appearances at the Boatman/Summers series, Jazz at the Pasadena Jazz Institute, Jazz at The World Famous Hollywood Magic Castle, The Muckenthaler Jazz Festival, The Steamers CalJAS All Stars series, Jazz at the Ambassador, Galli’s Piano and Jazz Club, and the Hip Kitty Jazz Club. Kate left California in the fall of 2012 to accept the position of Associate Professor and Program Director, Jazz Vocal Performance AT THE UNIVERSITY OF MIAMI.. CalJAS is proud to welcome her back! ONLY A FEW SEATS REMAINING!